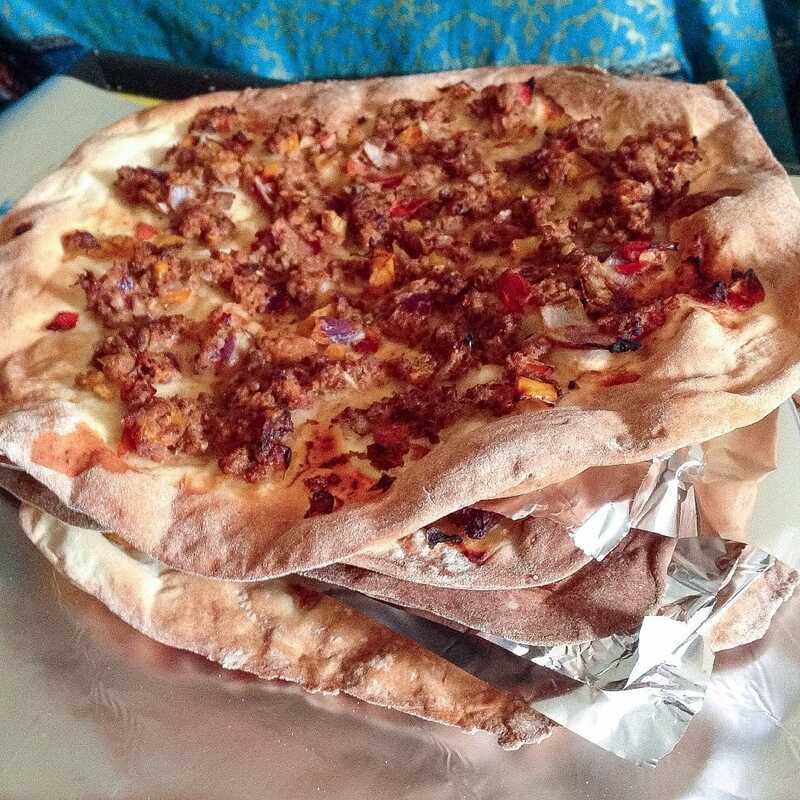 Lahmacun is basically a Turkish pizza with a thin and crispy base. We topped ours with minced beef and vegetables. It’s great served with hummus! So the Euros have started and somehow I’ve allowed myself to get sucked into watching multiple games despite having zero interest in football. In fact Will tricked me into going to Marseille this weekend to watch a match by confusing me with the appeal of a holiday. The weekend just gone we went round to Will’s parents’ house to watch the first Turkey game of the tournament and eat some Turkish food. Obviously I was in it for the food. My interest in the football was somewhat increased by the fact that I got Turkey in the office sweepstakes but then Turkey lost the match so I guess I’m destined not to care about the Euros for much longer. We decided to take some hummus and lahmacun to share with everyone. There was also kofte (made by Will’s dad), olives, bread, salad, rice basically I was in Turkish food heaven. Could Turkish food be my favourite cuisine? I couldn’t possibly choose. Let’s say top two. Ok top five. Impossible choice but it’s definitely up there. So lahmacun is kind of like Turkish pizza. It’s got a super thin, crispy base and is topped with meat and vegetables. We’ve made these before with minced lamb but for some reason the shops near us didn’t seem to have any so we ended up going with minced beef instead which turned out really well. Lamb would work just the same in this recipe so try whichever one you fancy. Mmm look at that stack of deliciousness! What you should do right now is go and make these, grab some hummus, some olives, some greek yoghurt, basically anything you fancy then go and have a delicious feast. Treat yourself! 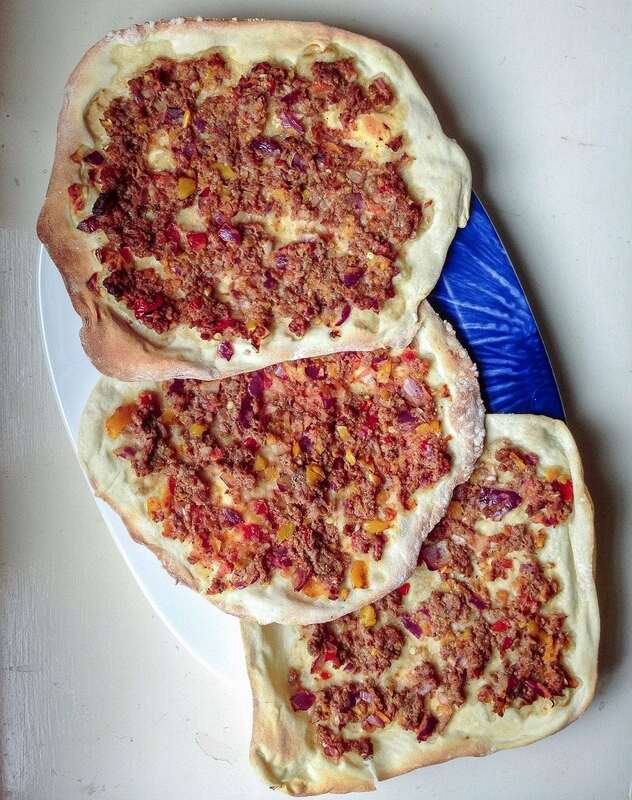 Lahmacun is basically a Turkish pizza with a thin and crispy base. We topped ours with minced beef and vegetables. It's great served with hummus! To make the base, mix the flour, yeast, salt and sugar in a large bowl. Add the oil and just enough warm water to form a soft dough. Tip on to a lightly floured surface and knead for 10 minutes. Place the dough in a lightly oiled bowl, cover and leave to stand until doubled in size – about 1 hour. Place the pepper, tomatoes, garlic cloves and red onion in a blender and blend until everything is finely chopped. Place in a bowl with the sumac, cumin, aleppo, salt and pepper and minced beef. Mix together with your hands until everything is combined. Preheat the oven to 200°C. Divide the dough into 8 equal pieces. Roll each portion out on a lightly floured surface to a thin, roughly 15cm-diameter disc. Spread the beef mixture evenly over the top of each one leaving a border around the edge. Place the lahmacun onto greased baking trays and place in the oven for 5-6 minutes until crispy and slightly browned around the edges. You may need to do this in batches. WONDERING WHAT TO DO WITH THE LEFTOVER INGREDIENTS YOU’VE GOT FROM MAKING THIS LAHMACUN? Use the sumac in this griddled chicken recipe. Aleppo pepper features heavily in both this great Turkish breakfast staple, menemen, and in myturkish kofte bowls.